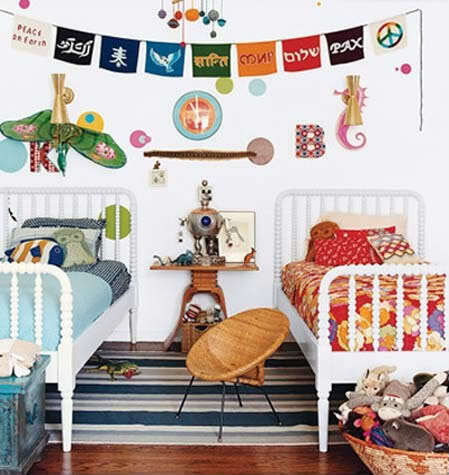 My friend texted me the other day and told me to look at the Pottery Barn Kids magazine. She wanted me to look at this page below...if you look closely (at the pillows), these fake siblings share the same names as my real kiddos (Drew and Kate with a "K"). Those PBK peeps really know how to pick a name :)! They did share when I had two babies and two cribs, but since they have gotten older, they have separate rooms. Hmmm....I shared a room with my sister (who is 15 months apart from me) my whole life and we both slept in twin beds until we went away to college. I wouldn't change having had a companion in my room to share stories before bed and stay up late laughing (and fighting). Will my kids be missing out by not sharing? 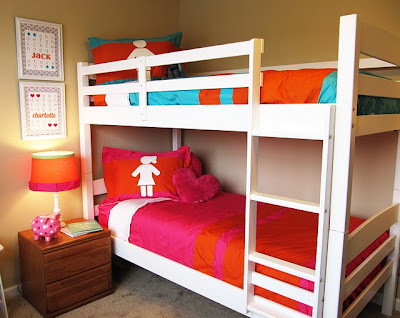 I think it is difficult with opposite gendered kids...2 boys or 2 girls might make for an easier transition and make for an easier time decorating! What do you think? A shared room would mean I would get that craft/work space I have been dreaming about! I might need to reconsider! I picked up 3 bags of large plastic eggs at Hobby Lobby. Each bag was 77 cents, but everything Easter was 40% off-cheap! I decided to cover the egg with a glue stick and roll the eggs in sand (I used sand from beach trips that I have used to decorate with previously). I allowed a little time for the sand to stick, and then I simply hand painted the eggs in three springy colors. The pink and blue are interior paints left over from other projects and the green is craft paint. Again, I just used what I had on hand. After the paint dried, I hot glued thin purple/white and pink/white striped ribbon to the back of the egg in different lengths. I bought the ribbon on clearance at Hob Lob for .59 a roll (needed 2 rolls). I taped the eggs to my mantle, so don't look too closely! I love the way these turned out-you would never know these eggs cost about 10 cents a piece and my kids love them! Tin pot: already had sitting around in my garage. Flowers in the tin pot are from Hobby Lobby. They have the best selection of fake stems and they are often on sale for 50% off. I got 4 stems for less than $10. I stuffed the pot full of plastic bags to keep the flowers upright and to make them appear fuller. I like how they are draped forward and sort of wild looking. Moss wreath: I had some moss left over from these projects and decided to make a small wreath to hang indoors. Candlesticks: I acquired several candlesticks in different shapes, sizes, heights. Some were already silver, and some I spray painted. I acquired them from thrift stores, IKEA, and had some I wasn't using. I think they add a little bling and a little drama to an otherwise boring fireplace (I am trying to talk my hubby into revamping the tile surround)! I also recently added this quote that I printed and framed. You can get one for yourself here. I picked up some photos today that I wanted to share! I have had two empty (large) matted frames I have been needing to fill for many months. I wanted a fairly recent photo of each child, and I wanted it to not be so obvious of a picture choice. After a few minutes of playing around on Picnik (you must check out this free site! ), I saved the retouched pictures and ordered two poster-sized prints from Walgreens online. The frame size was 16x 20, and it holds an 11 x 14 print, at which point it is considered a "poster". They still look and feel like a photo, but they call it a poster. I was having a little trouble with the lighting while snapping these photos, but you get the idea! Please excuse the glare! These will be resting on a shelf in our great room. I also wanted to send a BIG thank you to Holly from Life in the Fun Lane for mentioning and linking up my moss wreath and letter on her blog. Holly's blog was the first blog I ever became addicted to and a huge inspiration for me to experiment with making over some furniture pieces! A HUGE thanks is also in order to Emily at Emily A. Clark for featuring my moss wreath and letter on her blog today. I recently came across her blog and quickly wanted to stop back daily! Thanks to all of you who have stopped by to browse my little ol' blog. I love doing projects and being able to share them with others. I appreicate each person for stopping by and making comments. I hope you will come back! Loving her new rain boots! Even in the sun! Found them for 3.99 while thrifting! Love the faces in this pic! Partying with our Irish friend, John! Cookout with friends-loving this spring weather! A friend of mine recently saw Drew's room for the first time. 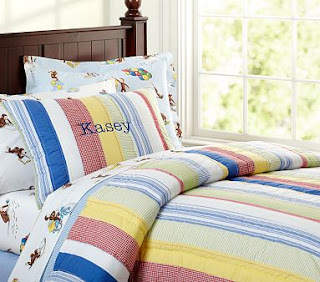 She immediately commented on his bedding and asked me if it was the Kasey Collection from Pottery Barn Kids. It is not from PBK, but it was the bedding that inspired me for his room, so I guess I did a pretty good job! I went back and forth on what to purchase. My final decision was determined by price as well as the fact that Drew had just turned 2 when he moved into his big boy bed, which meant that pee and puke would somehow find its way onto the bedding! I also thought if I hated it in 2 years, I didn't spend a lot of money, so I wouldn't feel married to it. The PBK version happens to be on sale right now, but the one I purchased was only ﻿$70, which included the queen sized quilt and two shams. Not bad, right? It gets excellent reviews online which was my final motivation to purchase it. 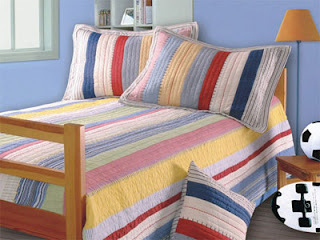 You can find this bed set on several different sites (google Prairie Stripes Quilted Bedding), but I purchased mine through walmart.com because of the free site to store shipping, which saves you even more! With all the money you save, you could have the shams monogrammed to look like the PBK room! You can see in the above picture that she used the rain gutter bookshelf. She used an aluminum gutter (I used plastic in Drew's room) and left it in one long piece since she had a large wall to cover. My niece is a bookworm, and this is the perfect height for her to grab books. Don't you just love the pop of color those books give off? This POANG chair from IKEA is being used as extra seating around the TV viewing space. Super comfy and loving the cool gray color. The walls are also a soft gray color. My sister and her husband love to travel, and they also lived in Germany for a few years. This print, from Made By Girl, was appropriate for the subtle travel theme she has going on. There is one little nook in the basement, so my sister first primed the wall with magnetic primer and then painted a few coats of chalkboard paint. I love the pop of black, and so appropriate for small children. I used to eat at this table growing up. I love that my sister has sanded, stained, and painted it to give it a fresh new look. They still have the original leather seats which make it look a little rustic. Hope you enjoyed the little tour! Thanks to my sis for sharing! Frozen yogurt...can't think of a better way to reward a good dental visit than with some sugar :)!!! !